Contest time on THP and that means you can win some awesome prizes. 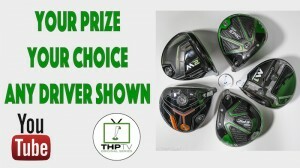 This week we are giving away any driver you want. Well almost any driver, as you can choose from any of the five featured. All you have to do is head over to the THP TV YouTube Channel and watch the video and it has all of the simple instructions right there. Then follow them, by telling us which driver you want and why you need it as well as subscribing to THP TV so you never miss an episode and you are all set. Good luck everybody. Winner will be announced next week. I’ll have to go with the Callaway GBB Epic because of their technology and the fact that I don’t always hit it in the sweet spot. So having misses that keep up with most other drivers on the market might be useful. Cobra King F7 for this guy please, it would help me drive it past my friends and have the numbers to prove it! Make sure you enter on the THP TV channel linked in the article. Callaway Epic for me. Felt great on the range, got good ball flight. The 2017 Taylormade M2 felt really nice, seemed like the ball just jumped off the face! Taylormade M2 please to match my new M2 iron set!! I hear so many good things about the Callaway Epic. It is time to switch from Titleist. Cobra F7 – because Cobra Connect is the preeminent stat tracking system and I can beat my friends with King of the Hole. Taylormade M1-I want front to back weighting not impressed with cobra reviews and reviewers hit callaway to the right. Cobra KING F7 for me. I still rock an original King Cobra in my bag. Throwback FTW!